"Now move. The world's not going to save itself." The concept of a real American hero is one that has made G.I. Joe one of the most popular franchises in toy history. America shouldn't have all the fun though and that's why England offered their own hero in the form of Action Man. Action Man #1 from IDW Publishing gives him plenty of time to introduce himself to new readers. The issue is written by John Barber, illustrated by Paolo Villanelli (prologue art by Chris Evenhuis), colored by John-Paul Bove and letters by Neil Uyetake (prologue letters by Shawn Lee). ACTION MAN IS DEAD-LONG LIVE ACTION MAN! He's the world's greatest special agent...until he dies saving the planet, with all the world's eyes on him. Now his young protégé has to step into the role-whether he's ready or not! Action Man was a response to the popularity of G.I. Joe, but that doesn't make him any less capable of saving the day. Barber focuses less on the concept of Action Man as a world-renowned soldier and more on the concept of Action Man as an idea. It's an effective approach because it draws upon what makes Action Man famous while simultaneously acting as an origin story of sorts. The issue is paced fairly frenetically and Barber jumps around time quite a bit for impact. The direction of the plot is cleanly presented courtesy of Barber's dialogue that implores the reader to keep their intrigue piqued. As a character, Action Man is part G.I. Joe and part James Bond and Villanelli captures the essence of both in his renderings. His approach is superhero-inspired as Action Man is defined by bold and clean lines accenting a very muscular physique. The linework continues for other characters as well in that Villanelli emphasizes their physiques and facial expressions. And Villanelli isn't shy about relying on that linework elsewhere, emphasizing the folds in clothes for instance quite effectively. Bove's colors are effective in making the character and his world feel sleek and modern. Action Man #1 has plenty that action or spy fans will want to take in. Action Man as a concept is well-received, but the current incarnation of the character still needs some work. Barber's script is a little jumpy but effective at introducing a new person in the role of Action Man. Villanelli's artwork is crisp and moves quickly alongside the plot. 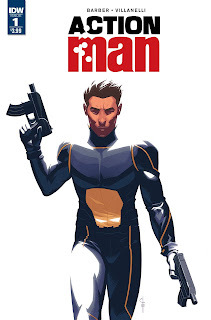 Action Man #1 is a fast-moving, spy adventure that will appeal to fans of those genres. Action Man #1 is in stores now.